The concept of Rotating Savings and Credit Associations (ROSCAs) has fascinated economists and anthropologists for several years. The altruistic dynamic of social capital involved in these tight knit groups in the developing world has provided an interesting comparison to the buyer/seller nature of credit markets in the developed world. By allowing users to pool their funds and then take turns to borrow from the pool ROSCAs appears to enable users to co-operatively invest and lend without formal institutions. While the basic rules of ROSCAs are easy to understand, it is much harder to master the dynamics and complexity of risk and returns provided by the groups along with day-to-day income, asset and expense decisions that form a constant state of financial flux. This becomes even more complicated in bidding ROSCAs, such as those found among garment workers in Cambodia, where group members bid for the collective fund by offering to pay higher and higher rates of interest. In fact, financial decision-making in the ROSCA world in many ways resembles a chaotic game like situation. 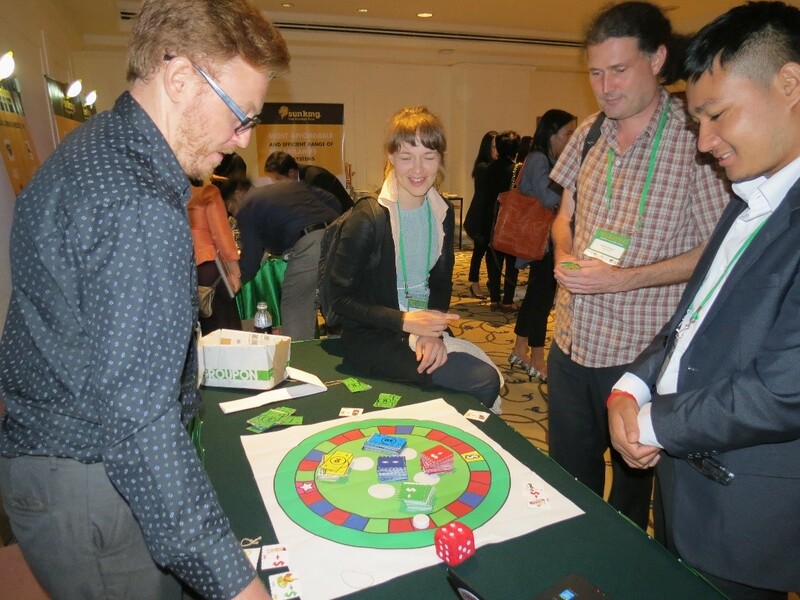 This gaming quality inspired Monash University and IMTFI to create a ROSCA board game -- one that would familiarize anyone from school students to bank customers to policy makers, on the elaborate financial and social dynamics that ROSCAs entail. as well as provide an education about budgeting and financial planning and management. In the successfully developed and pilot-tested ROSCA board game, each player or participant takes the role of a garment factory worker who earns monthly factory wages while making monthly contributions to the ROSCA. Each player then decides whether to borrow, how to spend, and how much to save for future needs while considering their respective assets and ROSCA obligations. Just as the boardgame Monopoly gives us a flavour of property market finance, this game provides a taste of the financial situation of a ROSCA participant in the developing world. In each round of the game players roll a die and move around the board landing on squares that make them draw cards, such as regular expense cards (eg food), urgent expense cards (eg medical treatment), asset cards to purchase income earning assets (eg livestock) and life event cards (eg a wedding) which move their position on the board. The bidding ROSCA system, common in Cambodia, means that players bid each month to borrow from the pool of funds. Many strategies can be formulated while deciding the interest rate to bid in order to borrow and buy assets whilst planning ahead for both regular and unanticipated expenses. The opportunity to borrow, steal the pot and leave the group is also a strategy option! Field-testing with Cambodian factory workers in March 2016 helped to fine-tune the game and make it reflect real world situations. Numerous rounds were played during work breaks in factories and surveys were conducted to gather feedback. Initially the game only involved more expensive assets, such as a motorbike or food cart. But it soon became apparent from feedback that income generating assets could be as cheap as $40 spent on egg-laying chickens. Difficulties in measuring the size of the pot were a primary hiccup but were overcome with clever suggestions from workers on how repayments and interest are usually calculated without relying on traditional accounting practices. This involves the participants arranging money in certain pile patterns on the table so it is obvious that the current balance is correct. Following its development and field-testing for accuracy the ROSCA board game debuted at the IMTFI conference in April 2016. 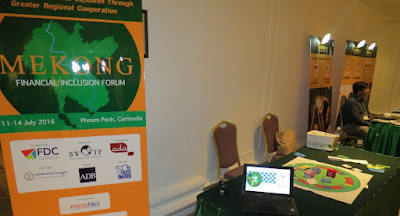 Since then, the game made its first appearance at a financial industry conference, the Mekong Financial Inclusion Forum at Phnom Penh on 11th-14th July, 2016 which was attended by stakeholders across the region from the development finance sector. During the conference the game was played by participants at the forum at a demonstration table setup outside the conference hall. Players found the game challenging and interesting as they attempted to deconstruct the dynamics of the game to develop a clear strategy. Players also disagreed on the best strategy and a Finnish consultant implied an aversion to borrowing at all and an Indian businessman suggesting that borrowing early to buy assets was useful. An American development fund representative was surprised at the complexity of the ROSCA structures in the region and noted that they should be more widely considered in development aid funding structures. Connections with the subject matter of the conference made the game relevant to a large number of participants. The continued disconnect between informal and formal financial services was a major topic of forum panels and the game provided insight into why ROSCAs continue to be a popular despite the increasing availability of financial services in the developing world. Most notably, the game showed the flexible nature of ROSCAs, their potential for higher return on savings and the community trust they contain that is often lacking in formal financial services. Feedback on the game design was very positive and the game continues to stimulate interest as a financial education tool. The game will soon commence its rollout among NGO financial education projects in Cambodia that aim to help school students improve their financial knowledge and money management skills. The game has also been used as a teaching tool with university students in Melbourne to provide them with a better understanding of the financial life of a garment factory worker in Cambodia. The next stage of the game evolution is to find investment and resources to develop it into a playable app format that can be distributed online. This will allow the game to be accessed more easily worldwide and used in the field by financial educators with access to tablets and smartphones. The existence of an app may also enable groundbreaking research. The app will have the potential to record player movements which will collect data to explore such areas as behavioral economics, trust, moral hazard and game theory across multiple cultures, demographics, and financial knowledge levels. 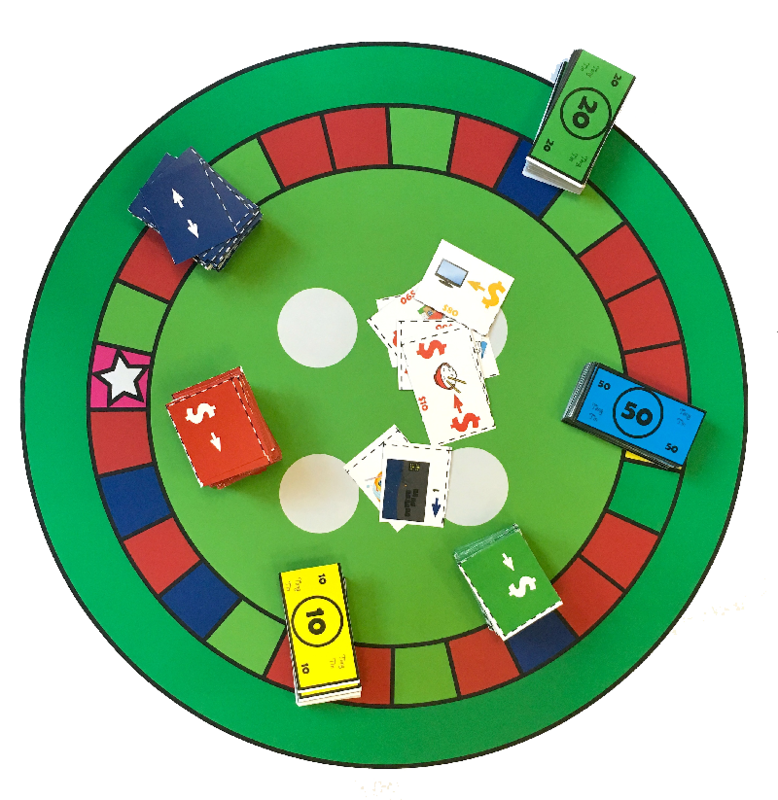 The strong interest in the ROSCA game so far demonstrates its potential as a valuable teaching tool plus, once digitized, it would be a research device that could help scale and unlock greater insights about the intricate workings of money, finance and social relations. This piece is an outcome of the 2015 IMTFI research project "Exploring Rosca Dynamics with a Cambodian Factory Worker Board Game" by Pushkar Maitra, Andrew Crawford, and Professor Paul Lajbcygier. Andrew Crawford is an Adjunct Research Associate in the Department of Banking and Finance at Monash University, Australia. He began research in microfinance at Monash and moved to Cambodia in 2010 as an AusAid Youth Ambassador based at the Cambodia Microfinance Association (CMA).